When it comes to finding the right catering for your wedding there are many different options available each offering something different, and a hog roast offers something unique. Many people are unsure about having a hog roast at their wedding because of vegetarian guests, the name hog roast only gives off illusions of succulent and tender meat. However we offer a vegetarian alternative with our menus, allowing you to have something for all of your guests. At Taste the Cracklin hog roast in Neston we have a number of different menus available to help you find the right one for your wedding, each menu comes with a number of different options so that you can choose the food which you like best. We can help you create your ideal wedding menu, whether it’s for the wedding breakfast or just a buffet for your wedding reception. Our Taste the Cracklin hog roast is sure to wow your guests and will be the wedding catering that they never forget due to its unique way of cooking and fantastic flavours. Where do we offer our tasty hog roast? 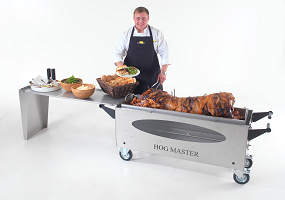 Neston, Peel, Ribchester, and UK wide, no matter where you are in the UK our hog roast is available for you. Simply get in touch with us today for an informal chat and to learn more about how we can help you.